based on a double power supply system, the IT-SWITCH monitors voltage quality and automatically transfers the load from the priority source to a back-up source without any interruption. The IT-SWITCH constantly monitors voltage quality supplied to critical loads. 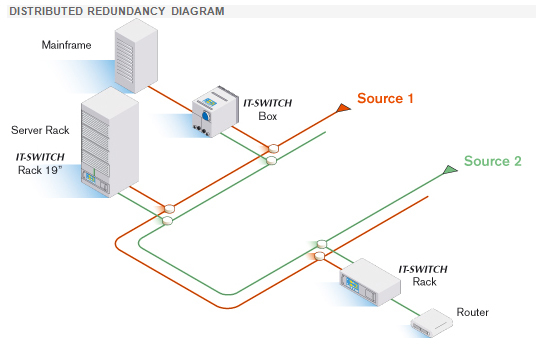 Should the chosen priority source fail, the IT-SWITCH automatically transfers the applications to the back-up supply in full safety and without any interruption. A hot-swap version can be easily changed without interrupting the load by using manual by-passes. The IT- SWITCH has been especially designed for easy installation in the most effective place, i.e. close to mission-critical loads.